For the bridge in Toulouse, see Pont Neuf, Toulouse. The Pont Neuf (French pronunciation: ​[pɔ̃ nœf], "New Bridge") is the oldest standing bridge across the river Seine in Paris, France. It stands by the western (downstream) point of the Île de la Cité, the island in the middle of the river that was, between 250 and 225 BC, the birthplace of Paris, then known as Lutetia, and during the medieval period, the heart of the city. The bridge is composed of two separate spans, one of five arches joining the left bank to the Île de la Cité, another of seven joining the island to the right bank. Old engraved maps of Paris show how, when the bridge was built, it just grazed the downstream tip of the Île de la Cité; since then, the natural sandbar building of a mid-river island, aided by stone-faced embankments called quais, has extended the island. Today the tip of the island is the location of the Square du Vert-Galant, a small public park named in honour of Henry IV, nicknamed the "Green Gallant". The name Pont Neuf was given to distinguish it from older bridges that were lined on both sides with houses. It has remained after all of those were replaced. It has been listed since 1889 as a monument historique by the French Ministry of Culture. 7 First daguerreotype ever with human being? As early as 1550, Henry II was asked to build a bridge here because the existing Pont Notre-Dame was overloaded, but the expense was too much at the time. In February 1578, the decision to build the bridge was made by Henry III who laid its first stone in 1578, the year when the foundations of four piers and one abutment were completed. Pierre des Isles, one of the builders, convinced the supervisory commission that the bridge, which was originally planned straight, would be more resistant to the river currents if its two sections were built at a slight angle. The change they adopted in May 1578. Further design changes were made during the summer of 1579. First, the number of arches was changed from eight and four to seven and five. This was not a problem on the north side, where nothing had been built, but on the south, where the four piles and the abutment on the Left Bank were already laid, the addition of the fifth arch necessitated reducing the length of the platform on the island, the terre-plein, from 28.5 toises to about 19. Second, it was decided to allow houses to be built on the bridge (though they never were). This required the widening of the bridge. The remaining piers were built over the next nine years. After a long delay beginning in 1588, due to political unrest and to the Wars of Religion, construction was resumed in 1599 under the reign of Henry IV. The bridge was opened to traffic in 1604 and completed in July 1606. It was inaugurated by Henri IV in 1607. Like most bridges of its time, The Pont Neuf is constructed as a series of many short arch bridges, following Roman precedents. It was the first stone bridge in Paris not to support houses in addition to a thoroughfare, and was also fitted with pavements protecting pedestrians from mud and horses; pedestrians could also step aside into its bastions to let a bulky carriage pass. 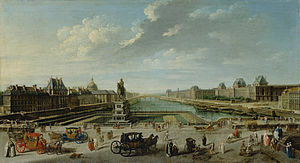 The decision not to include houses on the bridge can be traced back directly to Henry IV, who decided against their inclusion on the grounds that houses would impede a clear view of the Louvre, which the newly built galerie du bord de l'eau linked to the Tuileries Palace. The bridge had heavy traffic from the beginning; it was for a long time the widest bridge in Paris. It has undergone much repair and renovation work, including rebuilding of seven spans in the long arm and lowering of the roadway by changing the arches from an almost semi-circular to elliptical form (1848–1855), lowering of sidewalks and faces of the piers, spandrels, cornices and replacing crumbled corbels as closely to the originals as possible. In 1885, one of the piers of the short arm was undermined, removing the two adjacent arches, requiring them to be rebuilt and all the foundations strengthened. A major restoration of the Pont Neuf was begun in 1994 and was completed in 2007, the year of its 400th anniversary. The mascarons are the stone masks, 381 in number, each being different and which decorate the sides of the bridge. They represent the heads of forest and field divinities from ancient mythology, as well as satyrs and sylvains. They are copies of the originals attributed to the French Renaissance sculptor Germain Pilon (1525–1590), who also sculpted the tomb of King Henry II of France and Queen Catherine de'Medici in the Basilica of St Denis, five kilometers north of Paris. The mascarons remained in place until 1851–1854, when the bridge was completely rebuilt. At that time six of the original mascarons from the 16th century were placed in the Musée Carnavalet, along with eight molds of other originals. Eight other originals were first placed in the Musée de Cluny – Musée national du Moyen Âge, and are now in the French National Museum of the Renaissance in the Château d'Écouen. At the time of the reconstruction, the Renaissance masks were replaced with copies made by noted 19th century sculptors, including Hippolyte Maindron, Hubert Lavigne, Antoine-Louis Barye and Fontenelle. Fontenelle made sixty-one masks which are found on the upstream side of the bridge between the right bank and the Île de la Cité. At the point where the bridge crosses the Île de la Cité, there stands a bronze equestrian statue of king Henry IV, originally commissioned from Giambologna under the orders of Marie de Médicis, Henri’s widow and Regent of France, in 1614. After his death, Giambologna's assistant Pietro Tacca completed the statue, which was erected on its pedestal by Pietro Francavilla, in 1618. It was destroyed in 1792 during the French Revolution, but was rebuilt in 1818, following the restoration of the Bourbon monarchy. Bronze for the new statue was obtained with the bronze from a statue of Louis Charles Antoine Desaix, as well as from the statue of Napoleon in Place Vendôme, which was melted down. The new statue was cast from a mold made using a surviving cast of the original. Inside the statue, the new sculptor François-Frédéric Lemot put four boxes, containing a history of the life of Henry IV, a 17th-century parchment certifying the original statue, a document describing how the new statue was commissioned, and a list of people who contributed to a public subscription. The last Grand Master of the Knights Templar, Jacques de Molay, was burned at the stake on March 18, 1314, on the Île aux Juifs, a small island in the Seine just west of the Île de la Cité. The execution was ordered by Philippe le Bel (Philip the Fair) after Jacques retracted all of his previous confessions, which outraged Philip. The Île aux Juifs was joined to the larger island when the Pont Neuf was built. Between 1712 and 1719, replacing an earlier one, a large pump house was built on the bridge. It was decorated with an image of the Samaritan woman at the well. As a result, the structure (which included a carillon) was named La Samaritaine. Years after it was torn down (in 1813), Ernest Cognacq, a 19th-century merchant, set up a stand on the site and gradually grew his business to what became, in 1869, the (recently closed) department store La Samaritaine. Czar Peter the Great, who came to study French civilization under the regency of the Duke d'Orleans, declared that he had found nothing more curious in Paris than the pont Neuf; and, sixty years later, the philosopher Franklin wrote to his friends in America that he had not understood the Parisian character except in crossing the pont Neuf. In 1862, Édouard Fournier traced its history in his lively two-volume Histoire du Pont-Neuf. He describes how, even before it was completed (in 1607), gangs hid out in and around it, robbing and murdering people. It remained a dangerous place even as it became busier. For a long time, the bridge even had its own gallows. This did not prevent people from congregating there, drawn by various stands and street performers (acrobats, fire-eaters, musicians, etc.). Charlatans and quacks of various sorts were also common, as well as the hustlers (shell-game hucksters, etc.) and pickpockets often found in crowds – not to mention a lively trade in prostitution. Among the many businesses which, however, unofficially set up there, were several famous tooth pullers. One finds on the Pont-Neuf an infinity of people who give tickets, some put fallen teeth back in, and others make crystal eyes; there are those who cure incurable illnesses; those who claim to have discovered the virtues of some powdered stones to white and to beautify the face. This one claims he makes old men young; there are those who remove wrinkles from the forehead and the eyes, who make wooden legs to repair the violence of bombs; finally everybody is so applied to work, so strongly and continually, that the devil can tempt no one but on Holidays and Sundays. In the 16th cent. the Pont-Neuf was the scene of the recitals of Tabarin, a famous satirist of the day, and it was long afterwards the favourite rendezvous of news-vendors, jugglers, showmen, loungers, and thieves. Any popular witticism in verse was long known as un Pont-Neuf. In the seventeenth century, that bridge of memories, the old Pont Neuf of Paris, was the rendezvous of quacksalvers and mountebanks. Booths for the sale of various articles lined the sides of the bridge. People flocked there to see the sights, laugh, chat, make love and enjoy life as only Parisians can. Students and grisettes of the Quartier latin elbowed ladies and gentlemen of the court. Bourgeois families came to study the flippant manners of the aristocrats. Poodle clippers plied their trade; jugglers amused the quid nuncs with feats of dexterity; traveling dentists pulled teeth and sold balsams; clowns tumbled; and last, but not least, pickpockets lifted purses and silk handkerchiefs with impunity. Says Augustus J. C. Hare (Walks in Paris): "So central an artery is the Pont Neuf, that it used to be a saying with the Parisian police, that if, after watching three days, they did not see a man cross the bridge, he must have left Paris." Any popular witticism in verse was long known as un Pont-Neuf. One of the principal vendors of quack nostrums of the Pont Neuf was Montdor. He was aided by a buffoon named Tabarin, who made facetious replies to questions asked by his master, accompanied with laughable grimaces and grotesque gestures. The modern ringmaster and clown of the circus have similar scenes together, minus the selling of medicines. Under Louis XV, thieves and entertainers were joined by recruiters, or "sellers of human flesh", who did their best to lure newcomers to Paris and others "with as much violence as the sale of Negros in the Congo". Silversmiths and other luxury businesses nearby (which gave their name to the Quai des Orfèvres) drew visitors as well. One yearly event, held on the nearby Place Dauphine, prefigured the Salon des Refusés which would give rise to the Impressionists. During the celebration of the Corpus Christi (Fête-Dieu), the Place Dauphine hosted one of the most magnificent reposoirs (portable altars for the Host). Along with all the rich silverwork and tapestries placed on it, some local silversmiths ordered paintings for these. This led to art dealers being asked to participate and, ultimately, to the newest talents being shown at the Petite Fête-Dieu (the Small Corpus Christi), a reduced version of the Corpus Christi holiday which took place eight days later. Though their canvases were only shown from six in the morning to noon, this became an important opportunity for unknown artists to draw attention. Among other things, this led to the painters there signing their work, as was not frequent in the Salon – which was not always an advantage when the work was publicly and loudly critiqued. Showing works, which often had no pretense of a religious subject, they might then be noticed and find an entree into the official Academy. Chardin is one of the most famous painters to have started this way. In 1720, a young man of about twenty-two, son of the man who maintained the king's billiards, displayed a canvas here showing an antique bas-relief. J.-B. Vanloo passed by, looked at the canvas for a long time, found great qualities there, and bought it. He wanted afterwards to know the young painter, encouraged him, gave him advice, of which the latter perhaps had no need, got him work, which was more useful, and eight years later, the unknown of the place Dauphine was his colleague at the Academy of Painting.... he was called Jean-Baptiste-Siméon Chardin. The slow decline of the bridge's central role began in 1754: "Starting in 1754, the first year of the vogue, the madness of the boulevards, it was no longer the thing to talk about the Cours [the Champs-Elysées], and still less of this poor Pont-Neuf. To the Boulevard, at once, long live the Boulevard!". Still the bridge remained a lively place through the end of the century. With time, people became wary of its reputation and other changes subdued its atmosphere. In 1840, Lacroix wrote: "Once the pont Neuf was a perpetual fair; at present, it is just a bridge to be crossed without stopping." First daguerreotype ever with human being? About two years before Daguerre made his famous 1838 daguerreotype of the Boulevard du Temple, where a human being can be seen, the inventor photographed other places in Paris to experiment the new technique in plein air. 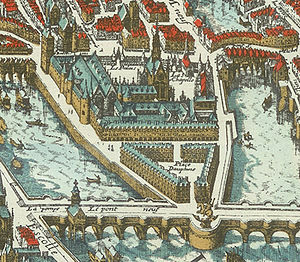 In the very first example of his own attempts, he made an image of the Pont Neuf and the equestrian statue of Henry IV. Since early images were mirrored, at the left side (actually the right side) of the statue one can clearly see one (or two) worker(s) lying under the statue shadow. In 1985, after years of negotiation with the mayor of Paris, the art duo Christo and Jeanne-Claude wrapped the Pont Neuf. Located near the Métro station: Pont Neuf. ^ a b c d e f g h Whitney 1929, pp. 137–141. ^ Ballon 1991, p. 117. A surveyor's report of 3 March 1578 is described and reproduced in Lasteyrie 1882, pp. 25–34. The lettres patentes were signed on 16 March 1578 (Lasteyrie 1882, p. 9). ^ Ballon 1991, pp. 117–118. ^ Ballon 1991, p. 118 and p. 324 (note 11). ^ Ballon 1991, p. 122. ^ "Mascaron-du-pont-neuf". Carnavalet Museum. Retrieved 13 October 2015. ^ Lacroix 1858, p. 337. ^ Fournier 1862, vol. 1 and vol. 2 at Google Books. ^ Cotolendi 1701, p. 292. ^ Baedeker 1884, p. 208. ^ Evans 1909, p. 342. ^ Lacroix 1858, p. 346. ^ Fournier 1862, vol. 1, pp. 299–300. ^ Fournier 1862, vol. 2, p. 345. ^ Lacroix 1858, p 347. ^ "Boulevard du Temple en 1838 (1837?) par Daguerre" (search for "Pont Neuf") at Niepce-daguerre.com. Retrieved 11 February 2013. ^ "Christo site page on the Pont Neuf". Archived from the original on 4 September 2007. Retrieved 15 May 2010. .
Baedeker, Karl (1884). Paris and environs: with routes from London to Paris and from Paris to the Rhine and Switzerland, eighth revised edition. Leipzig: Karl Baedeker. Copy at Google Books. Cotolendi, Charles (1701). Saint-Evremoniana: Ou Receuil de diverses piéces curieuses. Amsterdam: Pierre Mortier. Copy at Google Books. Note: "The author affixed the name of Saint-Evremont in order to quicken the sale" (Additions to the Library, Boston Athenaeum, 1890, p. 1257). Evans, Henry Ridgely (1909). The Old and the New Magic. Chicago: The Open Court Publishing Co. Copy at Google Books. Fournier Édouard (1862). Histoire du Pont-Neuf. Paris: E. Dentu. Vol. 1 (copies 1 and 2) and vol. 2 (copies 1 and 2) at Google Books. Lacroix, Paul (1858). Curiosités de l'histoire du vieux Paris. Paris: Adolphe Delahays. Copy at Google Books. Lasteyrie, R. de (1882). "Documents inédits sur la construction du Pont-Neuf," Mémoires de la Société de l'Histoire de Paris et de l'Ile de France, vol. 9 (1882), pp. 1–94. Copy at Gallica. Metman, Yves, editor (1987). Le Registre ou plumitif de la construction du Pont Neuf: archives nationales Z1f 1065. Paris: Service des travaux historiques de la Ville de Paris. OCLC 21504748. Strohmayer, Ulf (2007). "Engineering Vision: the Pont-Neuf in Paris and Modernity", pp. 75–92, in The City and the Senses: Urban Culture since 1500, edited by A. Cowan and J. Steward. Basingstoke: Ashgate. ISBN 9780754684237. Whitney, Charles S. (; reprint 2003). Bridges of the World: Their Design and Construction. Mineola, New York: Dover Publications. ISBN 9780486429953.